I’m super excited to share three of my favorite core conditioning exercises utilizing the TRX suspension trainer with you! All you need is a suspension trainer – any will do but this is the one I prefer – Get a Suspension Trainer. In any case, check out the video below and I will explain how many to do afterwards. Exercise 1 – Plank Frogger – Perform 3 sets of 10-20 repetitions, whichever suits your current fitness level. Exercise 2 – Suspended Mountain Climbers – Perform 3 sets of 15-20 repetitions. This exercise will feel slightly easier than the previous. Exercise 3 – Pike – Perform 3 sets of 10-20 repetitions as this is a challenging exercise for sure. Add these exercises to your core conditioning ab routine once per week to keep that tummy tight and toned! 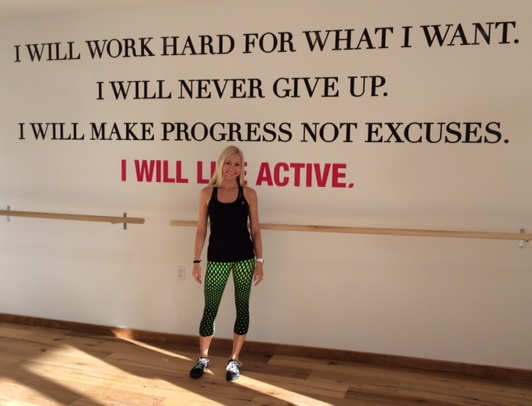 I am so excited to announce my new partnership with Lorna Jane Active in Del Mar, CA! If you haven’t heard about Lorna Jane, the founder and the brand, it can be summed up in three words – Move • Nourish • Believe. Lorna Jane is a world-leading activewear brand that empowers women to live their best life through Active Living. 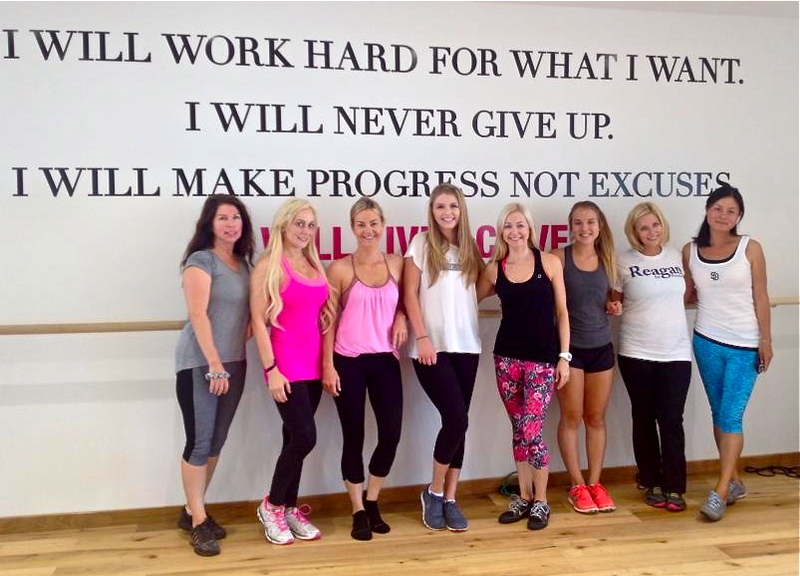 I have the honor of teaching my Ballet Body class at Lorna Jane Del Mar’s Active Living Studio. The thing that I love the most about Lorna Jane is that it is more than just a women’s activewear brand – it’s a lifestyle. I love the clothing pieces but more than that, I love what they represent and the confidence that I feel when wearing them. I hope to instill the Move, Nourish, Believe lifestyle in all of my Ballet Body clients who can access my complimentary workouts every Friday! What is Ballet Body? As a former professional ballet dancer, Ballet Body is a class that I developed 8 years ago as a way for women to learn the tightening and toning exercises just like dancers do to stay in shape year round. It’s not “barre” or pilates – it is more of a fusion of actual ballet and strength training. Participants can expect a workout with an emphasis on the legs, especially the inner thigh muscles. We also do upper body toning and core conditioning for a well rounded workout. Join me at Lorna Jane Del Mar in their active living studio every Friday morning at 10:15 am for a complimentary Ballet Body workout! For more information or to reserve your spot in the class, you can give me a call at (858) 598-5157 or visit my Ballet Body webpage. One of my favorite sweet treats growing up were buckeyes. As someone in the health and fitness profession, I know that the original recipe for these delightful, melt in your mouth treats is far from healthy. Luckily I was able to come up with a tasty healthier alternative using protein powder. Mix all ingredients together. If consistency is too sticky, add more protein. If consistency is too dry, add more honey. 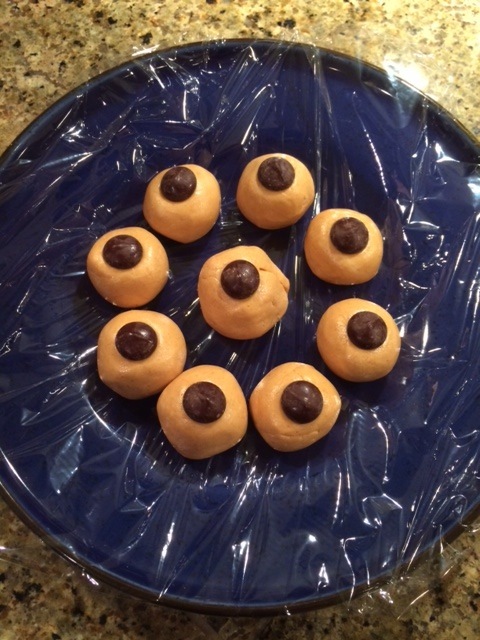 Roll dough into balls and place on parchment paper or saran wrap. Add a chocolate chip to the top of the balls. Place in the freezer for 30 minutes. Enjoy! I can’t believe it is July 1st already! Luckily I have another full month of fitness motivation for you all in one calendar. Just click and print the photo below – or save it to your desktop for motivation. For more fitness motivation be sure to join my Facebook page and share your results with our community! June is pretty much the start of Summer as we know it and with the weather heating up, so should your workouts! 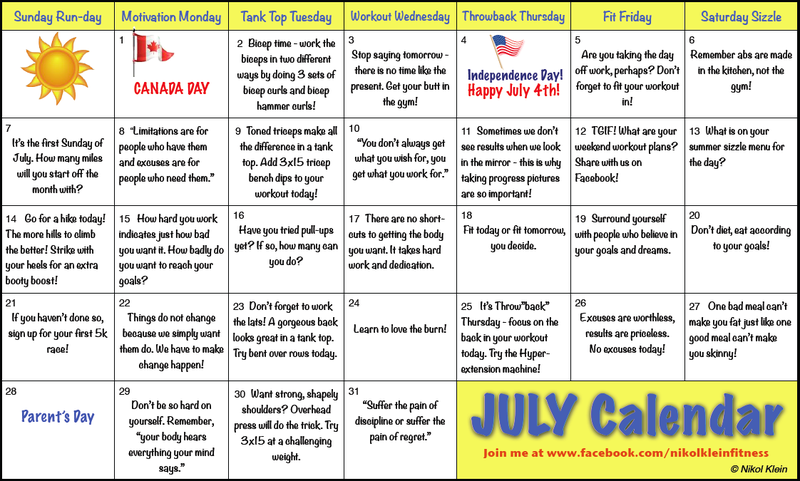 Click the workout calendar below for a full month of motivation! Print it out and post it on your refrigerator like many of my clients do! Want “tutu worthy” legs without having to put in all of the hours at the dance studio? My favorite exercise for getting the legs tight and toned in a pinch is a variation of the hamstring curl. Done using a large exercise ball, this exercise will leave your hamstrings popping whether you are looking to feel confident at the beach or for a night out on the town. Give it a try! Directions: Start with the legs resting in a turned out position on the ball. Make sure your knees are straight. Now slowly bridge the hips up, keeping the arms at your sides for support. With the feet flexed, slowly curl the ball in towards your back. Repeat for 12-15 repetitions or as many as your fitness level will allow! *For more daily workouts like this, visit my Facebook Page! 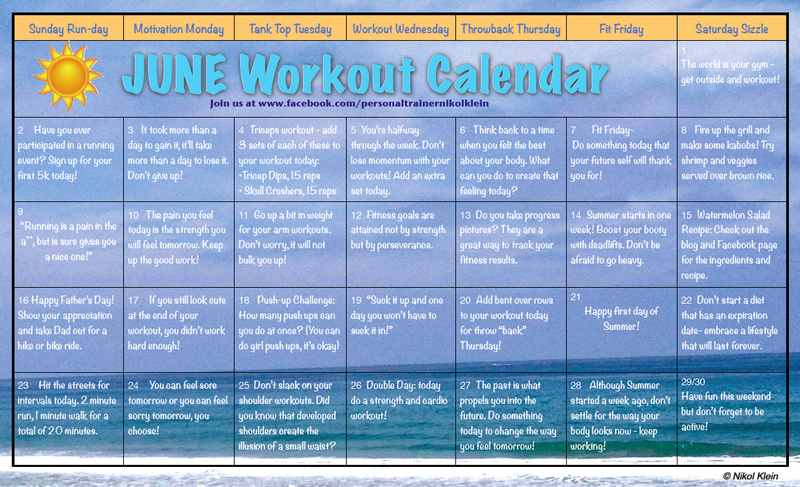 Your May workout calendar is here! Let’s get motivated and ready to built a better body before summer. I have created a calendar with a full 31 days of motivation and workouts. 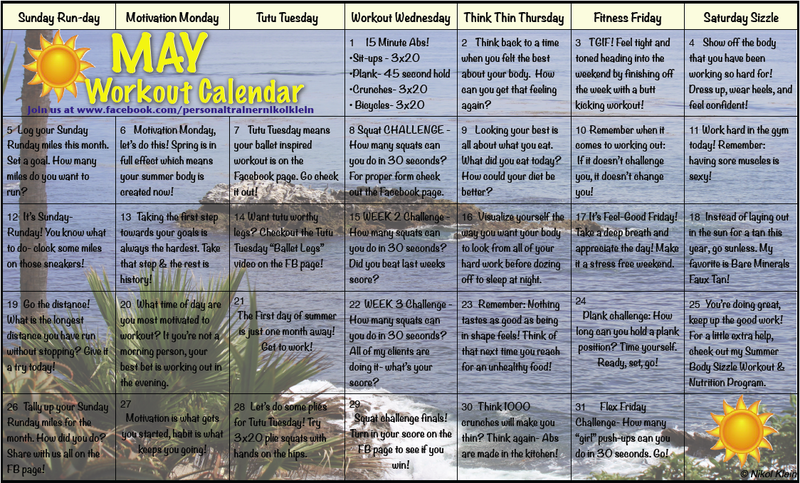 Just click on the calendar photo below and print for some extra inspiration! Also, be sure and join us on the Facebook page where I share more tips and videos/photos of the exercises listed on some of the calendar days!